2014-15 Magnum Non-ABS Caliber 16" Handlebars w/SCII Installation Kit. Magnum Caliber Handlebar Kits. 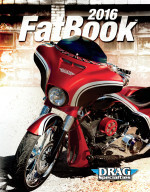 Bagger style for select non-ABS Harley-Davidson® motorcycles. Magnum 1.25 Caliber handlebars are manufactured with the highest quality construction, including machined control mounts and feature high luster chrome or gloss black finish for an unsurpassed appearance.